Medieval Excalibur Swords for sale are 35 inches in all. 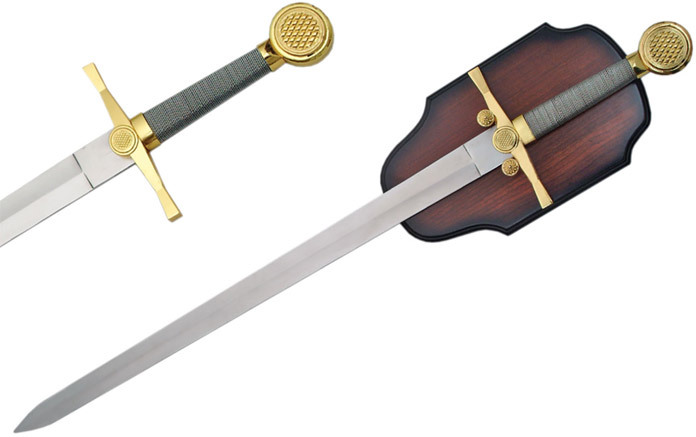 These swords are designed to honor the tradition of King Arthur and the Knights of the Round Table and include a display plaque. The 26 inch stainless steel blade is ready for display featuring an unsharpened factory edge. The handle features a pewter colored tight wire wrap. They have a gold colored cast metal cross guard and gold colored wheel pommel. The round pommel features a raised crosshatch pattern which is repeated in a smaller circle on the guard. These swords include a free wooden wall display plaque. Buy the Medieval Excalibur Swords for only $59.99.